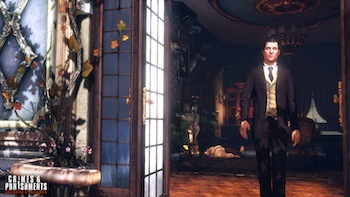 The next Sherlock adventure game will feature moral dilemmas and the Unreal Engine 3. Everyone's favorite public domain detective is back for another installment in the long-running adventure game series, and franchise developer Frogwares is pulling out some major redesigns. Sherlock Holmes: Crimes & Punishments will introduce moral decision making and an entirely new art style designed for the Unreal Engine 3. Unlike "moral sliders", publisher Focus Home makes it clear that these new choices will actually affect the game. "Each case offers real freedom to players, who will have to make important moral choices instead of simply enforcing justice by the book. All decisions have an influence in the game, so bear the weight of your choices!" Meanwhile, Frogwares is ditching their old, proprietary engine for the well-worn shaders of the Unreal Engine 3, which will surely be hailed as "the engine that powered a generation" in years to come. Along with the new polygons, Sherlock is getting redesigned with a "more modern character perfectly matching the new artistic ambitions of the title." Thankfully, the screenshots seem to avoid any sort of obvious corollary to current interpretations of the character. While no release date has been announced yet, Crimes & Punishments will be available on the PC, Xbox 360, and the PS3.